Chinese tourism to U.S.: America is passing up a big opportunity. Chinese tourism is a huge economic opportunity. America is blowing it. 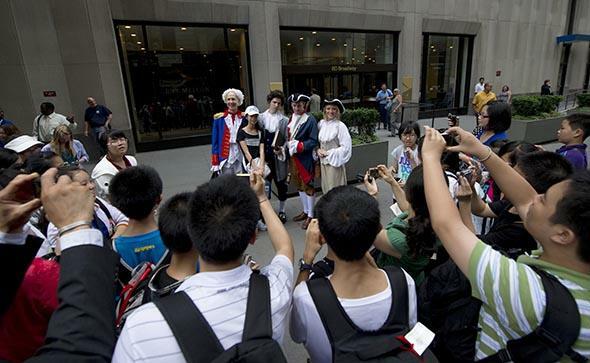 Chinese tourists in New York in 2010. The U.S. needs more of this. It’s a familiar story: We’re spending ourselves broke, to China’s benefit. Americans are addicted to the low prices afforded by Foxconn factories from Shenzhen to Wuhan. We’ve outsourced our jobs, hollowed out our manufacturing sector, and put the squeeze on the American workers whose consumption drives our economy. There’s some truth in that fear. But it misses a much bigger issue: that the emerging Chinese middle class will soon outstrip America’s by several multiples. The good news is that affluent Chinese would love to spend money in America. The bad news is that we’re not making it easy. When it comes to China, tourism may be the biggest opportunity America is blowing: economically, politically, and geo-strategically. The emergence of more than 1 billion Chinese into the global middle class over the next few decades will be the driving cultural force of the 21st century, and it’s hard to understate the importance of tourism in that equation. The tourism industry employed 266 million people and earned $7 trillion in 2013, accounting for 9.5 percent of the world’s economy and 9 percent of its workforce. Chinese tourists took 83 million trips in 2012 and spent $102 billion overseas (up 40 percent from 2011), making China the largest source of tourists worldwide. But that number pales in comparison to tourism within China: Business trips and spending alone exceeded $200 billion in 2013, up 14 percent year over year. China’s business travel market—hotels, airports, rental cars, etc.—will overtake America’s by 2016, and China will be the world’s largest overall tourist economy by 2027. It’s easy to chalk this up to size: China has more than four times the population of the U.S., and its biggest cities dwarf their American counterparts. But even on a per capita basis, China is starting to outcompete the U.S. The average visitor to Las Vegas spends about $1,600 per trip; the average visitor to Macau spends $3,200. It’s not that the U.S. isn’t benefiting from Chinese tourism: CNN reports that the number of Chinese tourists to the U.S. jumped from 400,000 in 2007 to almost 1.5 million in 2012. According to the U.S. Commerce Department, Chinese visitors spent $9 billion in the U.S. in 2012. Shopping, not sightseeing, is their favorite tourist activity—luxury department stores in posh areas like Beverly Hills’ Rodeo Drive are seeing as much as 60 percent of their annual business come from Chinese tourists, and many are now accepting Chinese credit cards like UnionPay. Nine billion’s not bad, but our take could be bigger—perhaps by an order of magnitude. According to analysis by Robert Lawson and colleagues at Southern Methodist University, the U.S. could increase tourism by 45 million to 67 million visitors and earn an additional $90 billion to $123 billion in visitor spending by eliminating restrictions on tourist visas. Visa requirements for Chinese tourists are particularly onerous, and removing them could make our country more accessible and attractive. Demanding a visa from a country’s travelers in advance is associated with a 70 percent lower level of tourist entries than from a similar country where there is no visa requirement. The U.S. requires an advance visa from citizens of 81 percent of the world’s countries. Complete the DS-160 online application and upload photos; schedule two appointments at the applicant service center and the consulate; pay application fees; go to the applicant service center; give fingerprints, and have your photo taken; go to the consulate for an interview; don’t annoy the interviewing consular official who has absolute power to accept or reject your visa application; wait 10 days. The waiting period—which the Office of the Press Secretary for the White House claimed in 2012 to have averaged a week or so—is often delayed well beyond that, for reasons only occasionally specified. The processing fees can cost upward of $100 per applicant, a fee structure well at the upper limits of what many middle-class citizens in developing economies can afford, and that hits families and groups of travelers especially hard. There may only be a handful of U.S. embassies or consulates in your entire country. (Brazil, a country as large as the U.S., has only four; all of China has six, serving upward of 1 billion people.) If you can’t make it to an embassy or consulate, you’ll face additional, potentially monthslong delays as you navigate these steps through the postal service. Your application can be denied at any time, for any reason, or sometimes no reason at all. Lucky travelers from one of 38 countries can get into the U.S. without preapplying for a visa, thanks to the Visa Waiver Program, created in 1986. The list of countries in the VWP—which includes the U.K., South Korea, Germany, Taiwan, France, Australia, and the microstates of San Marino, Andorra, Malta, and Liechtenstein—appears to read arbitrarily. In theory, the VWP is used to fast-track citizens of countries with whom the U.S. has enjoyed historic friendship, economic cooperation, and trust. In practice, VWP membership requirements bear little grounding in the logic of economics or security. Poland, for example, has been kept off the list for many years, even though it has been a member of the European Union since 2004, has one of Europe’s fastest-growing economies, and poses little apparent risk to the U.S.
Poland is, however, a party to the Schengen Agreement: a treaty that permits international travelers to move freely among 26 countries in Europe. Schengen has its critics, mainly those concerned with border security, national sovereignty, and illegal immigration. But Schengen has had an undeniably positive impact on European tourism. France, an early Schengen signatory, is the world’s largest tourist destination by travelers each year, attracting 83 million foreign visitors in 2012—and of those visitors, the fastest-growing segment was Chinese. Chinese tours to France grew by 23.3 percent in 2012, and Chinese tourism to neighboring Schengen partners such as Spain and Italy has also been booming. The U.S. is well-positioned to compete with France and the Schengen states for its share of the Chinese market. Chinese tourists consider the U.S. their top choice in hypothetical vacation spots, and those who visit spend an average of $4,400 per trip. By all accounts, we could improve the situation dramatically by reforming, digitizing, and normalizing our policies on travel visas. (Of course, it’s worth mentioning that it’s not exactly easy for an American to get a tourist visa to China, either, and it’s politically hard to imagine America lifting its visa requirements without China reciprocating.) Instead, our current political climate favors increased border security and tougher travel restrictions. Few politicians would stake their reputations on easing travel access, especially to putative adversaries like the Chinese. But odd as it may seem, letting Chinese visitors into the country is vital to our national security. Isolating ourselves from China, economically or culturally, creates more distance between us—and widens room for misunderstanding. During the Cold War, tensions between the U.S. and the USSR were heightened by the fact that neither country truly understood the other. Cultural misapprehension thickened the fog of war. We don’t need to build a new Iron Curtain between our country and China. And we need to keep pace with the globalization of popular culture, Chinese and otherwise. We need a free exchange of culture, ideas, and money. America’s global leadership has always depended upon its soft power, contingent on the mutual trade of cultural goods. Whether or not America is a City on a Hill, it can’t afford to be a City on an Island.